copacetic zine | susie ghahremani art show opening this friday! susie ghahremani art show opening this friday! One of my dearest pals is having an art show in Portland, and I am so excited! Longtime friends of copacetic will immediately recognize Miss Susie Ghahremani for her Boygirlparty® line of artwork and products that we used to carry at copacetique. 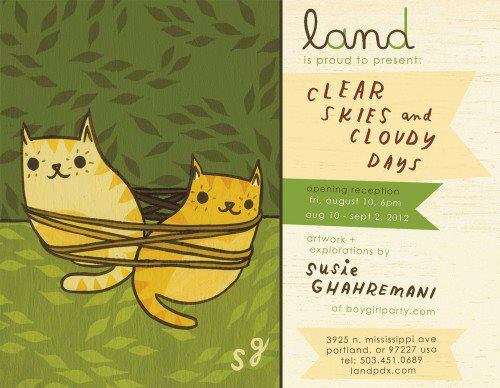 Her solo exhibit “Clear Skies and Cloudy Days: Artwork and Explorations” will be on display at the Land Gallery in Portland, Oregon from August 10-September 2, 2012. There will be an opening reception on Friday, August 10th from 6pm to 9pm, and I can’t wait! See you there!